Anyone who has followed this blog over the years knows that I have a huge soft spot for 80s alternative music, synthesizers, musicians who think outside of the box, and sultry British voices. When Marilyn Roxie (founder/creator of net music label Vulpiano Records) asked me to review Neurotic Wreck’s latest compilation, I must say I hit the lottery on all counts. This wonderful collection of tracks transported me back to such tremendous musician favorites as Underworld, Jesus & Mary Chain, Depeche Mode, Kraftwerk, and a short-lived but fantastic group called Ashengrace. There’s even a covert reference to a well-known Gary Numan song, but I am not going to spoil the experience by disclosing which one. The tracks are relatively short, extremely captivating, and arranged in such a brilliant way that the segue from one to another keeps the listener glued to the playlist. And, the fun part is, the artists I’ve named here are by no means the complete list of influences that the listener will identify. Sandy Missparker (SM): I’m going to show my hand up front and admit I was blown away from my first listen. You had me at “The Wakeup Call” which was, indeed, a wake-up call for me. Typically, I’m a bit skeptical when first asked to listen to a new (to me) artist’s work, but that all went out the window pretty quickly, once the playlist got rolling. So, I’m curious: how long has Neurotic Wreck been making music? DAN WRECK: As Neurotic Wreck, I’ve been doing this since 2011; steadily putting out collections of songs compulsively to a deafening silence, a name known to literally fives of people. I’ve been in bands from an early age, though (as most artists worth anything have been, I know). There’re other projects I’m involved with, but it’s not fair to elaborate on those, (because) if I do that people’ll go “Oh Dan obviously came up with this bit” if they like what I’ve done here, and quite often the things people pick out as me having contributed–I haven’t! SM: I clearly hear some of my favorite 80s artists influencing your music. I’d love to hear from you specifically who it is that influences the direction of your music, and what attracts you to theirs? DAN WR ECK: Here’s where I get to be tedious and nerdy! You already picked out the Numan thing, and like recognizes like there: one autistic monomaniac has to recognize another. I first heard Numan as a teenager and went on about how great he was to very disinterested friends. Prince is another big influence on me, another case of like recognizing like; not that I’m as technically gifted as him, but like me he was an androgynous, sexually ambiguous weirdo and artistic control freak. Also from the 80’s there’s New Order, as you’ve likely picked up from the tracks where I’ve shamelessly stolen Peter Hook’s style of playing bass. On the subject of bass, there’s also Barry Adamson: stuff like Speak In My Voice and After The Quiet sort of bear his imprint. As well as having played with many of my favorites at some point, his solo stuff manages to be soul and jazz influenced while still being very North West English; and let’s not forget the North Will Rise Again. Then outside of all the obvious synth-pop stuff, loads of 60’s girl group records like I Never Dreamed by The Cookies, immortal solid gold pop; the drama and the melody in them is what sticks with me. Scott Walker for similar reasons. Rowland S Howard, undoubtedly, lingers over everything I do, but I could drone on about him forever (and in an article on Dennis Cooper’s excellent blog which Google have in their infinite wisdom taken down for no reason, I do). Coil is another one; I’m not sure it’s apparent from Glow Ghosts, but Jhonn Balance is a similar spectre pacing through things I’ve written. Maybe it’s apparent from Rune Cloud and some of the more esoteric lyrics. MARILYN ROXIE: Here’s where I have to chime in, because it is Dan’s influences that I shared as favorite artists, both literary and musical, that caused me to pay more attention to his music submission, which was from an email he’d sent to my old music blog A Future in Noise back in December of 2012 with his Leave Tonight – Mixtape Side 2. Not only that, but the way that he is able to integrate it all together with his own personal style instead of the hopelessly derivative way that some artists do–that’s what really impresses me. Our mutual love of Coil and Dennis Cooper were initial conversation topics and I immediately invited him to also release material on my netlabel Vulpiano Records, which I don’t ask everyone. Vulpiano is really my own little curated paradise of independent and unsigned artists who I really love; and now Dan and I are together actually as a couple, as well, so it is very exciting to be able to work together more closely on what is happening musically. SM: I have a deep fascination for single artist “bands” (and even duo-artist such as Underworld) who create such intricate orchestrated melodies. What does your studio look like and what types of instruments/devices do you use to develop your music? DAN WRECK: My studio is basically wherever I’ve plugged in my digital 8 track recorder: it’s a Boss BR-600, and basically all I do is record on that, then export the tracks onto an old Window XP desktop with the Reaper Workstation installed on it. There I mix, add effects, and sometimes add software synths into it; but most of the sounds come from an electric guitar with 4 strings, a bass with 3 strings, a Novation synth with a key missing, and an old drum machine. Most of my equipment is at least cosmetically broken. Being able to afford more expensive equipment would be great personally, but wasted on me because I’d just dither around with it trying to make cool sounds rather than writing songs. I have to work within limits. SM: In order to take your music out on the road, would you be willing to train other musicians to play various parts, or is it something that you could reproduce live as a solo act? Is live performance even something that you would consider doing? DAN WRECK: Live performance is something I’ve done with other projects and will continue to do so because I love doing it. But as Neurotic Wreck, it’s quite unlikely, frankly, for the time being. Never say never, but for now it’s not on the menu. I don’t see the point of getting other talented people in and then getting them to just play what I ask them to when they may well have better ideas than me. So, if it does happen, then it’ll most likely be me doing it solo. That said, who knows? It’s under the name “Neurotic Wreck” not “Dan Shea:” it could, down the line, become more of a band. It has been, briefly, in the past. SM: What got you started making music initially? Did you wake up one day and say, “I’m going to be a musician,” or did a specific person or event set you on that path? DAN WRECK: Well, I’ve been around music from a very early age: my dad is a very talented songwriter, so it’s probably in my blood. I didn’t set out to be a musician or a songwriter; in fact, sometimes, to be quite honest, I wish I wasn’t. I wish I could be one of these people who’s happy just to be a consumer, rather than a producer. Ignorance is bliss, after all, but that’s not the way it worked out. In fact, for quite a long time I thought everyone could do what I do: being autistic, as I’ve mentioned, I just assume everyone can write songs or play an instrument, because if I can do it, it must be easy! Then I’ve spoke to people about it and they’ve looked back at me like a dog being taught a card trick, so it’s only recently sunk in that I may actually be quite good at all this. SM: How would you classify your music? In other words, does it fit neatly into one genre, or does it span several different types? Short answer: Just call it post-punk; no one knows what it actually means, but it’s an accepted bit of terminology. And if you say “post-punk,” people just nod and assume you know what you’re talking about. Long answer: I don’t think it fits neatly into one genre, but I don’t think a lot of music does. There’re so many genres out there and they exist more as a marketing thing than as any remotely helpful guide to what you’re actually getting from the music. I’d say genre is more the domain of the gate-keepers, if you will: journalists (who I like) and publicists (spits over shoulder and crosses self). It spills over a bit but I’d say mood is a more useful way of categorizing music than genre tags. It is for me, anyway. To each their own. MARILYN ROXIE: Post-punk makes a lot of sense as a descriptor…also, experimental synth, a dash of neo-folk that goes counter to people’s expectations around that genre as it can be overly anti-fascist. I do agree that it isn’t necessary to think of genre when he can do so many different styles with ease. 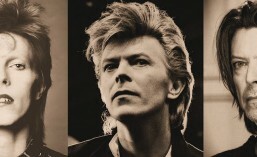 SM: It’s not unusual for artists to evolve their musical direction over time, but there is an evolution of sorts that happens in the span of the 13 tracks of this one dynamic compilation, a la David Bowie. Was that intentional? DAN WRECK: It may have been intentional, but it wasn’t my intention. I got Marilyn to order the tracks because I think if you’re looking at something as an album rather than purely a collection of songs (important distinction even if it is an irrelevant one for many people these days), then the order is incredibly important. You’ve just mentioned Bowie, so a case in point would be 1.Outside: at the end of what is a fairly heavy-going album, especially from a multi-platinum megastar, there’s “Strangers When We Meet,” which is one of his most moving songs and even more effective because of what it’s come after. If it had been in the middle, as an individual song it’d still be wonderful; but the right sequence of tracks, as someone who still believes in the album as a viable format, is utterly crucial. MARILYN ROXIE: I’m obsessive about playlists so I spent a lot of time working with Dan’s tracks to get the order just right. I always knew that I wanted “The Wakeup Call” to be the first track and “Tell Me What to Swallow” to be last, but finding the right ebb and flow of the softer and punchier songs was a challenge and I’m glad the flow came through in the end. Many of these tracks are from totally different recording periods. SM: What is the hierarchy of lyrics and music—for example, do you write lyrics and then formulate the music to enhance them, or is it the music that gives birth to the lyrics? DAN WRECK: It changes from song to song, really. If the song has a definite purpose, then it’s usually the lyrics come first: “One Skin Too Few” is something very personal about my feelings on gender and also the treatment of the mentally ill, and “Speak In My Voice” is about these same themes. They both started from lyrics. “After The Quiet” became something very personal, but that started from the descending melody line after the lyrics are sung in the choruses and expanded outwards. SM: The label behind the promotion of “Glow Ghosts” is Vulpiano Records. I’ve had the pleasure of knowing its founder, Marilyn Roxie, for about 7 years now, thanks to the magic of the Interwebs. Marilyn, you are an extremely gifted keyboard artist in your own rights, but you seem to get a lot of satisfaction promoting others. Can you give us a little background on what makes Vulpiano Records (and Marilyn Roxie) tick? MARILYN ROXIE: Vulpiano started off just as my idea of having a place to host exclusive content from independent and unsigned artists that had submitted to my old music blog (A Future in Noise, now on a bit of a hiatus). It isn’t always easy promoting yourself and throwing your content out there and hoping for the best; in the past few years, a lot of blogs have ceased to exist and only the super-popular remain, so the whole landscape is really different than it was in the late 2000s as well. Creative Commons and places to host free and legal music like Internet Archive and Free Music Archive have persisted, however, and there are a lot of exciting online radio and podcast platforms. I’m always searching for ways to share all of the great music I have gathered up. Vulpiano is really representative my personal taste and artists I have become friends with that I think are really interesting across genres and want to show to other people, though experimental, electronic, and folk tend to predominate a bit. I do have plans to do another album of my own, which I’ve not put out since 2009 with New Limerent Object, but it’s taken me awhile to really figure out where I want to go with my own music. I am gravitating towards drone and shoegaze a lot lately, but I don’t want to just copy my favorites. I am a little too hard on myself, like many musicians. I enjoy seeking out new and exciting material so much sometimes it is hard to stop and actually go back to doing my own music! I am also involved in video art now and thinking about ways to combine that with my own music. I’ve been making videos for other people, including Dan, so I may want to make an album that has a music video for every song, or something like that. I am really interested in doing something multimedia, at any rate, but I’m not entirely sure of the final form just yet. I hope to do this late this year or early next. SM: What can we expect in the future from Neurotic Wreck (and please don’t say it was a one-off—that would be SO disappointing!). DAN WRECK: Well, after the huge stream of free releases over the last five years, I’m finally charging for something: Sandalphon, which will be out on Small Bear Records on the 22nd of September, the Autumn Equinox. Sandalphon is something of a genre exercise; two years ago when I recorded the bulk of those songs, I started investigating the genre of neofolk. Again, as I said earlier, this genre tag is just a convenient way of linking things with a similar ethos together; but that influenced Sandalphon an awful lot. Although, not to worry, there’re no banjos on it, the guitars are still plugged in, there’s still lots of synth, and the drums are still as mechanized as God intended. So that’s what’s coming up next. After that, who knows? So, there you have it. I can’t emphasize enough the brilliance of this album, “Glow Ghosts,”, and urge you to add it to your music collection. The beauty of creative genius is that it keeps our lives interesting, gives us a positive outlet as listeners, and promises us always something exciting to look forward to. This entry was posted in 10's Music, 80's Music, Post-Punk, New Wave, Criminally Underrated, Electronic/synthesizer, Independent Music, Obscure 80's Music and tagged 80's Music, Dan Shea, Dan Wreck, Electronica, Glow Ghosts, Marilyn Roxie, Neurotic Wreck, Obscure, Post-Punk, Underrated Artists, Vulpiano Records. Bookmark the permalink. Loved reading this interview. Thanks for covering them and exposing me to a new artist. That means a lot….want to feature YOU here one day soon! Hi KaM, and thanks so much! I enjoyed that. Be well and all the best to you!